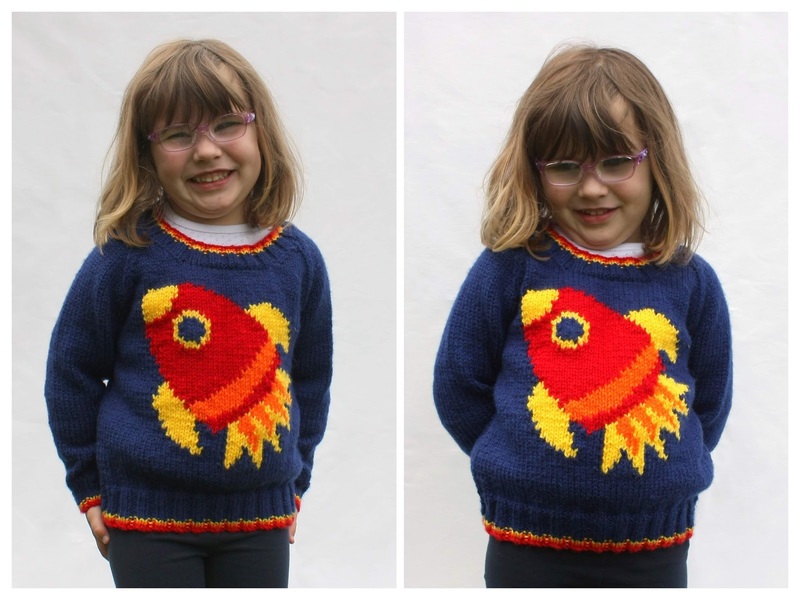 I have two new patterns for you, both on a astronomical theme: the Reach for the Stars children's jumper and cushion. Both items are from my Reach for the Stars collection, and go with the baby blanket that I released last year. Each item in the collection features a brightly coloured space rocket with a fiery trail, inspired by one of my children's favourite toys. Both patterns are suitable for intermediate level knitters, and the intarsia section is provided both as charts (in greyscale and colour for your preference) and as written instructions. The cushion features a large intarsia rocket, is fastened with four buttons across the back and is designed to fit a 46 cm (18 inch) square cushion with a little negative ease to ensure a nice plump cushion. The cushion is knitted flat in one piece, starting at the middle of the back with a ribbed button band, then the first half of the back, the front and the second half of the back are knitted in stocking stitch, and finally the ribbed buttonhole band is worked. The cushion is seamed down the side edges using mattress stitch. The cushion sample is knitted in Paintbox Yarns Simply Chunky* [100% acrylic: 136 m (149 yds) to 100 g] in Midnight Blue (MC, 337), Buttercup Yellow (CC1, 322), Blood Orange (CC2, 319) and Pillar Red (CC3, 314). The Reach for the Stars children's jumper is knitted in pieces from the bottom up; the neckline is picked up and knitted in the round after seaming the shoulders of the jumper. The rocket motif is incorporated using the intarsia technique. The jumper is knitted in aran weight yarn, and has a casual fit with approximately 9 cm [3.5 in] positive ease, making it perfect as a cosy extra layer in the winter, or an outer layer as the weather starts to warm up. Sample shown is knitted in size 4 years, in Paintbox Yarns Simply Aran* (100% acrylic, 184 m [201 yds] per 100 g ball) in Midnight Blue (237, MC), Buttercup Yellow (222, CC1), Blood Orange (219, CC2) and Pillar Red (214, CC3). The pattern is written in 6 sizes: 2 (4, 6, 8, 10, 12) years, to fit chest sizes 53 cm [20.75 in], 58.5 cm [23 in], 63.5 cm [25 in], 67 cm [26.5 in], 71 cm [28 in], 76 cm [30 in] with approximately 9 cm [3.5 in] positive ease. If you'd like to pick up either pattern, why not make the most of my introductory offer? If you buy any of the patterns from the collection: the cushion, children's jumper or the blanket, there's 25% off until 11.59pm BST, June 24th 2018, no code needed. The patterns are also available in an ebook, which is also included in the offer – it's a bargain as you get all three patterns for the price of two – perfect if you're thinking of making more than one item. All the patterns are available now in my Ravelry store.